Usually, I spend the first day of the new year like any normal person would: hanging out in flannel pajamas, watching TV, nursing a hangover and maybe going to a movie or a New Year’s Day brunch with friends. But, to usher in 2014, I jumped into the frigid waters of the Atlantic Ocean. 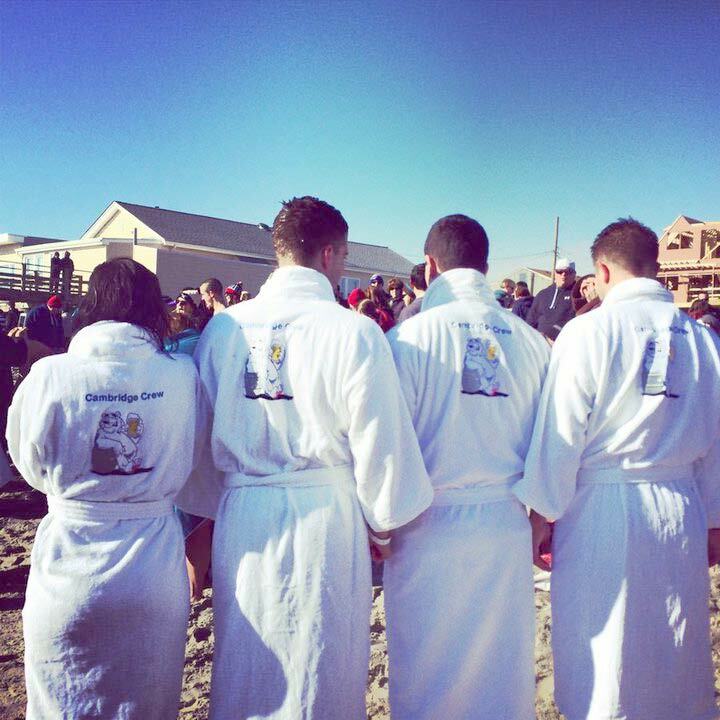 Accompanied by my sister, boyfriend and nephew, I joined hundreds of others as part of the 20th Annual Polar Bear Plunge in Margate, New Jersey. The Coney Island Polar Club was founded in 1903, making it the oldest in the nation. 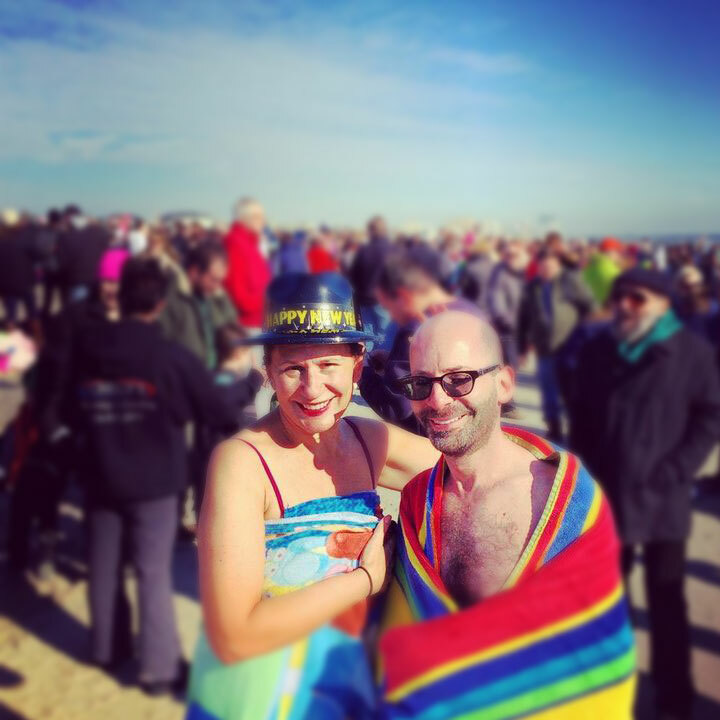 It attracts thousands of zany polar bears and onlookers every January 1st, including my brave Reuters colleague Peter, who participated in the group’s 111th New Year’s Day Polar Bear Plunge. Peter says it was nearly impossible to exit the freezing ocean this year because he hit a paparazzi blocking the shoreline. A bagpiper leads the would-be Polar Bears down the block to the beach. Like Coney Island’s version, the Margate-rs wear wacky costumes — I spotted a woman in a formal dress and an entire flock of “bears” in white robes and Polar Bear hats. What does it feel like to take the plunge? If I’m reading the marine websites right, the water temperature was about 50 degrees on the southern Jersey shore. The temp in Coney Island was closer to 40 degrees. Yet another reason why the Jersey shore rules — the water is always warmer. How long do you stay in the ocean? Just the mental part of it. You have to psych yourself up for the actual event. It helps to do it with friends — peer pressure is an excellent motivator. Once you’re standing on the beach, you’re in the middle of a giant party (people gather on the beach with dogs, booze and cameras), which adds some mental momentum. In addition, wear clothes and shoes that can be taken off and put on easily and quickly. I wore a sweatshirt and sweatpants. My nephew and boyfriend both wore robes. I love a good challenge. Plus, there is also the “wow” factor from friends and family — as in “Wow, you are really crazy.” Or “Wow, you are really cool.” I shared a lot of my Polar Bear photos though social media, boosting my cred with my colleagues and friends. There are some actual health benefits, too. Studies have shown that winter swimmers experience more vigor. I definitely had an adrenaline rush the entire day after the swim. Yes. After submerging yourself in cold water, some people experience a condition known as “cold shock response” and have trouble breathing. Several years ago, a friend of a friend died doing the Coney Island Polar Bear swim after he dove into shallow water and broke his neck. I did not share this detail with the people in my Polar Bear posse. This is my second Polar Bear extravaganza. I took the plunge with my sister, my ex and a bunch of friends in Margate about 11 years ago — way back when I was in my 30s. I’m thinking I can handle it about once a decade. The irony, of course, is that I was in Florida over Christmas, where it was typical December weather for the state: a little sun, clouds, 75 degrees and a bit windy. In other words, too warm for this snowbird. My toes never even touched the ocean water. It is 5 degrees outside in NYC. There’s no way I would do this today. You’re my hero. Maybe next year…..